I sometimes make cakes for other people's birthdays, and I usually do what they request, which is more often than not very simple cakes - ordinary cake layers, perhaps some mashed banana or vanilla custard and then whipped cream. That's like the very basic Swedish birthday cake. And I'm pretty bored with it. Nor do I like it that much. I'll keep making them for my husband (who's even happier if I decorate it with gummy bears) but for Titus this year, I wanted to make a high, American-style cake with frosting. 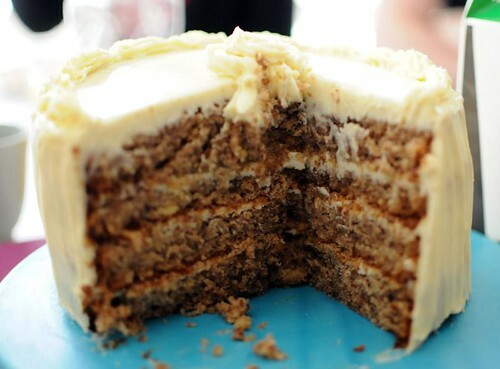 Hummingbird cake kept popping up - in cookbooks, on blogs - and I couldn't ignore it any longer. It's similar to a carrot cake, but has pineapple and bananas to keep it moist, rather than carrots. It's absolutely delicious. And should you have leftovers, they'll keep well in the fridge. Mix flour, cinnamon, baking soda and salt in a bowl. Beat both sugars with the eggs, until really fluffy. Add vanilla, oil, crushed pineapple and banana. Stir in the flour mixture, and finally, the walnuts. Divide in two well-greased cake tins, about 20 cm in diameter. Bake at 175°C until they're no longer sticky inside - about 45 minutes. Remove from the oven and let cool completely, on a rack. Whisk all ingredients to a smooth and fluffy frosting. Frost in between the cake layers, and all around the cake, when the layers are completely cool. My aunt-in-law has requested a lemon cake for her 50th birthday this weekend. Of course I'll make lemon cake but it's going to have yellow and pink vertical layers and lemon buttercream frosting à la I Am Baker! That cake does look beautiful. 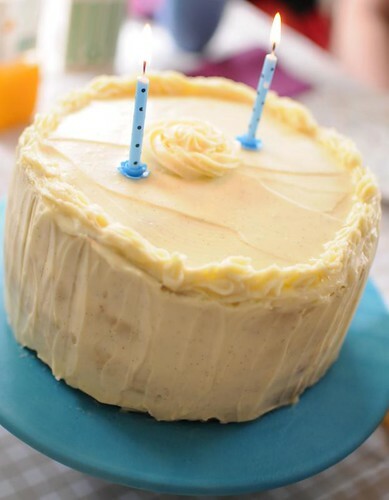 Back to the regular birthday cakes - do you just put a layer of mashed banana or do you mix it with something first? That sounds yum but doesn't it go all brown? Alice, I usually mash it with a little cream. it can go a little brown, but since it's inside the cake, it doesn't bother me. Have another layer of strawberry jam, and then vanilla custard! Yummy! It looks awesome... except I hate the evil banana fruit! LOL. All your cakes look good to me. Ok question. I tried this cake and it was a monumental failure, I don't know what I did wrong. For the baking soda you mention, is it baking powder or bicarb of soda, or a mixture of the two. I cooked it for 1h20 and it was doughy and yeegh inside. Not sure what I did wrong. Liam, sorry to hear that! Baking soda is called bikarbonat in Sweden, so bicarb of soda sounds right. I wonder what went wrong though.. I've only tried it once, but it came out well.